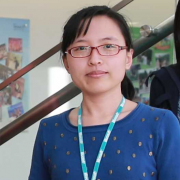 Dr. Cuiling Lan is a Lead Researcher at Microsoft Research Asia. She received her B.S. degree and Ph.D. degree in Electrical Engineering from Xidian University in 2008 and 2014. She had been a research intern at Microsoft Research Asia for more than three years and was awarded MSRA Fellowship 2011. She was also a visiting student to University of California, Los Angeles (UCLA) from 2012 to 2013. Her research interests include computer vision, video coding/communication. Her current research focus is on deep learning for pose estimation, action recognition/detection, person re-identification. Internship opportunity! We are looking for interns who have excellent coding ability, passion on research, and the background on deep learning. Please feel free to send an email with your CV if you are interested in the research intern position.